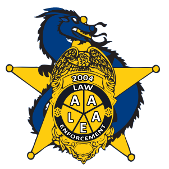 The Asian American Law Enforcement Association (AALEA) is a non-profit organization and chartered member of NAPOA. AALEA was established in Fairfax County, VA in 2004. 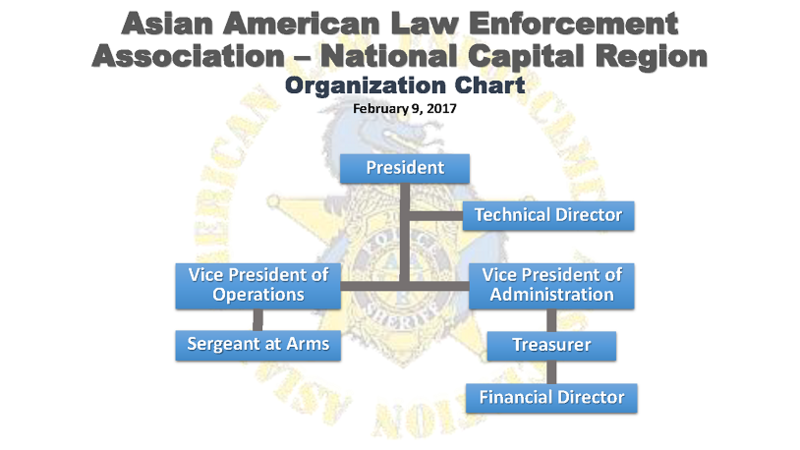 AALEA members are comprised of Asian-American police officers, sheriff deputies, other local and federal law enforcement officers and civilians. Because AALEA recognizes, appreciates, and promotes diversity within the organization, We welcomes membership of all ethnicities who have appreciation and the desire to join a strong brother and sisterhood we share. AALEA represents various law enforcement agencies in the Washington metropolitan region and reflects the incredible diversity in both the public and law enforcement communities that we serve. The goals of AALEA are to promote and strengthen positive relations between the Asian communities and the police, promoting equal opportunity in recruitment, retention, mentoring, career development, and advancement of Asian Pacific American Officers in their respective agencies. Wilson Lee was elected as President of AALEA-NCR in August 2016. Wilson joined the Fairfax County Police Department, Virginia, in 2008 and currently holds the rank of First Lieutenant. 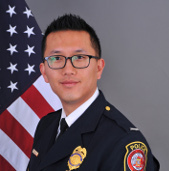 During his career with Fairfax County Police Department, he worked patrol in the Reston District, served as a school resource officer at Herndon Middle School, patrol supervisor, Policy and Directives Change Team, and Planning and Research Bureau. 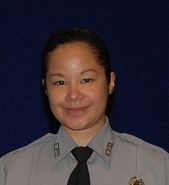 Wilson is currently assigned as the Police Liaison Commander of the Public Safety and Transportation Operations Center. Wilson graduated with a Bachelor of Science degree in Administration of Justice from George Mason University in 2007, and a Masters of Professional Studies degree in Security and Safety Leadership from George Washington University in 2012. Aaron Spooner has been a police officer with the Fairfax County Police Department, Virginia, for over 13 years and holds the rank of Sergeant. During his career in law enforcement, he has worked in a variety of positions to include Patrol and the Neighborhood Patrol Unit. As a Detective in the Major Crimes Bureau, he held assignments in: Financial Crimes, Child Abuse, Robbery, and Homicide. Currently, he is a squad supervisor at the Fair Oaks District Station. He graduated with a Bachelor of Arts degree in History and Government from Daemen College in 2005. 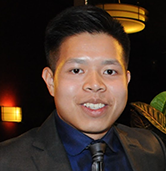 Michael Wu was elected as Vice President of Operations of AALEA-NCR in December 2017. Wu joined the U.S. Postal Service Office of Inspector General (OIG) in 2012 and now serves as a Criminal Investigator/Special Agent to the Capital Metro Area Field Office. 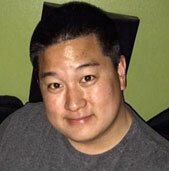 During his career with the OIG, he worked in the Congressional Liaison Department, the Executive Office of the Assistant Inspector General for Investigations and General Counsel, the Northeast Area Field Office, and the Special Inquiries Division headquartered in Rosslyn, VA. Wu graduated with a Bachelor of Business Administration degree in International Business from James Madison University in 2011, and a Masters of Public Policy degree in National Security from George Mason University in 2013..
Andrew Hsieh has been actively participating in events related to NAPOA since his attendance to the 2007 NAPOA Conference. He has been a member of AALEA-NCR since 2013. In 2006, Andrew became a Federal Police Officer with the U.S. Secret Service Uniformed Division. He was initially assigned to the White House Branch of the Presidential Protection Division and was tasked with a variety of duties to include force protection, access control, observation, and public engagement. He also maintains collateral duties of a magnetometer advance officer, honor guard team member, and White House Special Operations Section (Special Events) officer. He has been detailed to the U.S. Secret Service Recruitment Division since October 2010. He manages recruitment programs of field offices in the western United States and of field offices outside of the United States. Andrew has a Bachelor of Arts in Criminal Justice/Criminology and a minor in Chinese Language from the University of Maryland at College Park. Brandi Horita was elected the Sergeant at Arms in May 2017. She has been with the Fairfax County Police Department, Virginia since 2010 and holds the rank of Police Officer First Class. She has worked in a variety of positions within the department including crime analysis, patrol, crime prevention and public affairs; she is currently assigned as a Community Liaison Officer. Brandi holds a Bachelors of Arts degree in Psychology, A Masters degree in Criminal Justice Administration and a Masters in Business Administration (MBA). Josh Kennon was appointed Technical Director after previously holding the position of Interim Sergeant at Arms. 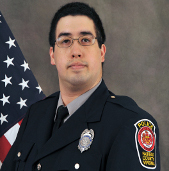 He joined the Fairfax County Police Department in 2008 and holds the rank of Police Officer First Class. He is currently assigned to the Digital Forensics Section of the Cyber and Forensics Bureau. His previously held assignments include School Resource Officer and Patrol out of the Reston District Station. Josh has a Bachelors of Science in Business Administration from the Millersville University of Pennsylvania. 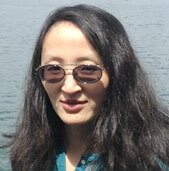 Yin Jia has fourteen year experience in public, private, government and not-for-profit accounting. She developed budget and tracked financial performance. She prepared budget and financial reports for executive board, leadership team and managed an accounting and budget team. Yin has a Master's Degree in Accounting from West Virginia University and she is a Certified Public Accountant and licensed in Virginia. © 2017 Asian American Law Enforcement Association AALEA-NCR.